This article of Geeabo teaches you that What Is Vulkan Run Time Libraries Software In Windows 10. Friends, nowadays, the Vulkan Run Time Libraries software is commonly found in Windows 10 devices. But the question arises here, what is this?, Is this a virus?, Is it a malware? When the user has not downloaded and installed this software then how does this software come into the PC automatically? So friends, let me tell you that Vulkan Run Time Libraries by LunarG, Inc. is not a virus, not a malware and not a harmful software. The Vulkan Run Time Libraries software is installed by the display card makers like Nvidia, Intel or AMD, and you will be seeing this software since last driver update. Vulkan Run Time Libraries is a 3D graphics API which mostly comes bundled with Nvidia Drivers. This is not malware or virus, instead, it is a 3D graphics and component API, by Khronos Group. It installs on your PC without any permission and notification. You should know that Vulcan is important for some of these 3D games like Talos Principle, Star Citizen and CryEngine, etc. If you are not playing any of these games then you can remove this software from your PC. Note : If you want to uninstall this software then you can do it but remember one thing that you will not be able to manually install this software again. If you have uninstalled this program from your PC and now you are facing problem in playing some games then you have to re-install the graphics driver on your PC to download the Vulkan Run Time Libraries. So this was the full info to remove and re-install Vulkan Run Time Libraries. 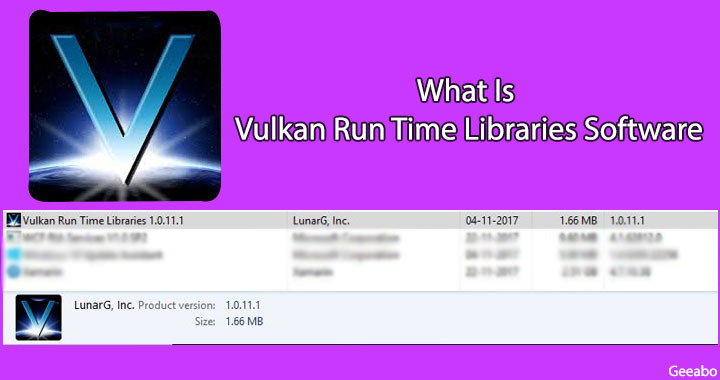 Hope you guys like this article What Is Vulkan Run Time Libraries Software In Windows 10 and you have learned something new with the help of this article. Please Do Like, Comment and Share our articles if you really appreciate my work. I heard that Vulkan is performing better than Direct X 11 and even a competitor to Direct X 12. Will we ever be able to install it manually like Open GL? No, we can’t install it manually like Open GL. Thanks for the comment, George!